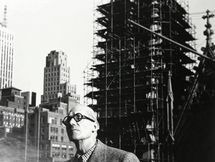 Pierre Jeanneret (March 2nd 1896 - December 4th 1967) was a Swiss architect who collaborated for about twenty years with his better known cousin Charles Edouard Jeanneret alias Le Corbusier. There association started in 1922 when they opened a studio together. In 1927, they were in the fifteen architects who contributed to the influential modernist Weissenhof Estate exhibition. Their working relationship lasted until 1940 when Jeanneret left German-occupied Paris, moving first to Ozon, in the Pyrenees mountains, then joining colleagues Georges Blanchon and Jean Prouvé to fight as a unit of the Resistance in Grenoble. Together they subsequently set up the firm Bureau central de construction (BCC), experimenting in prefabricated metal housing. 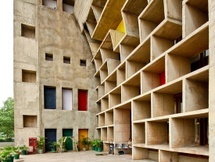 Jeannaret resumed his collaboration with his cousin in 1950, when Le Corbusier invited him to work with him, and the British architects Maxwell Fry and Jane Drew on the the plan and architecture for city of Chandigarh in India. 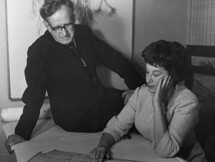 Jeanneret stayed and continued to work in India until 1965. He became the Senior Architect of the city of Chandigarh, the new administrative capital of Punjab and designed the majority of the housing for the capital city as well as the Punjabi University in the city’s sector 14. He had to return to Geneva for health reasons and died two years later in the city where he was born. Jeanneret’s deep attachment to Chandigarh was poignantly made manifest on April 25, 1970 when, according to his wish, his ashes were dispersed in Chandigarh’s Sukhna Lake.